pipe without the use of wrenches. 1. Once the desired depth has been reached, pick up and set the slips on the first joint. 2. Break out this connection, but do not spin fully out of the connection. 3. Activate the ABO Unit allowing the Backoff Barrel to lower. 4. 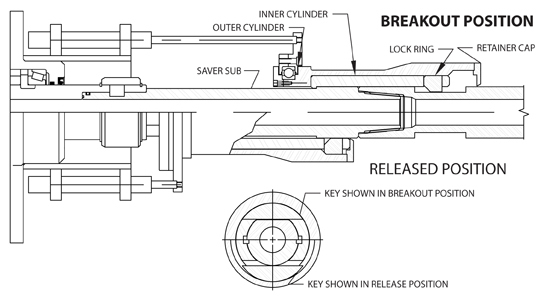 Begin slow rotation to the right; this will allow the Lock Ring to align with the flats and the Backoff Barrel will drop. 5. Pull up to the next joint, set the slips, and break and spin out first joint. 6. Lower the drill pipe to the stand or floor, release the ABO Unit, and spin out the first joint. 7. Lower head to make up the next joint. 8. Spin into this connection, but do not torque up connection. 9. Activate the ABO Unit and repeat Steps 2–9.